On Aug. 10, the corner of West High and Conway streets saw the most foot traffic since its closure almost a year and a half ago. Members of the Dickinson community gathered to welcome Carlisle residents to the ribbon-cutting ceremony of the new High Street Residence Hall. “The Carlisle community has been watching this construction project with great interest for more than a year,” said President Margee Ensign. “We’re happy to give the community a look inside this building that we are immensely proud of and that we know will serve our students well.” She was joined by members of the Dickinson College Board of Trustees as she cut the red ribbon and opened a new chapter for residential life at Dickinson. Dozens of community members filed in to a large, open lounge space, one of three located in the new residence hall. Members of the Liberty Cap Society were standing at-the-ready to assist people around the 40,000-square-foot building, highlighting all of its features. Reserved for upper-level students, it's aiming to become Dickinson's sixth Leadership in Energy and Environmental Design (LEED)-certified building, but the first to aim for the Platinum for Homes standard. With over 85 single and double rooms, the residence hall will house 129 students starting in this fall. In addition, soundproof study rooms provide ample community space with a great room, living room, kitchen, outdoor patio and indoor bicycle storage for nearly 50 bikes. 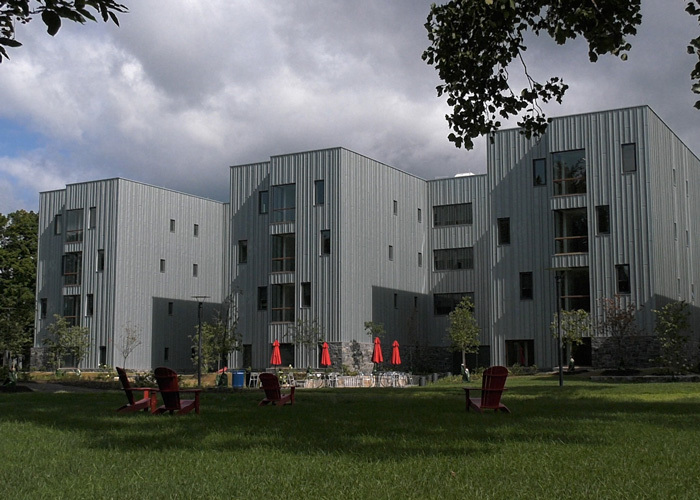 The residence hall, designed by New York-based architectural firm Deborah Berke Partners and built by Lancaster County-based Benchmark Construction, also boasts an impressive exterior with a wide array of flora, including 92 trees and over 16,000 other plants. Equipped with energy-efficient exterior walls and roof, high-efficiency windows and an upgraded stormwater-management system, the building embraces Dickinson's commitment to carbon-free operations in 2020 and caps off a historic six-year campus enhancement effort that includes a new athletic training center, soccer field and interdisciplinary greenhouse, as well as an expansion of the Kline Fitness Center and Rector Science Complex. Learn more about the new residence hall in this Snapchat takeover from Maizie Ober '21.